At 23:00 we were already receiving negative sentiments, you can tell that not long soon after the price started going down, meaning the negative sentiments on Twitter resulted in direct downwards price action. 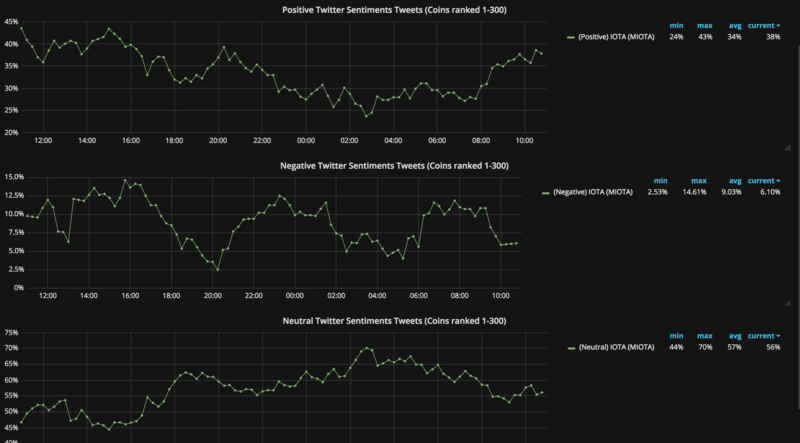 Now at approximately 01:30 UTC (June 27) we can see that Negative sentiments start to go down (Just before 02:00 AM on the sentiment chart). Right afterwards, and as can be seen on CoinMarketCap, we have a slight increase in market movement and a profit of approximately +400 Satoshi’s. Slight negative sentiment follows and a further decrease. Right after 09:00 UTC (June 27th) we start to see a decrease in negative sentiments again and another increase in price and another increase of approximately +400 Satoshi’s. By using sentiments to catch negative feedback happening to a certain cryptocurrency, we can at times find out where the market is going to move before it even happens. Cryptolume supports sentiments for the top 400 cryptocurrencies, find out more about us at https://cryptolume.co. Is there a way to just look at positive, negative or neutral sentiments? Yes, the below page will show charts that only look at positive, negative or neutral which will give you a more visible look at what’s happening. You can also click any of the above charts and press “View” to see a full screen version of the chart that you can also track in real-time by using our auto refresh feature on the time selector. Again, with any data such as technical analysis, sentiment analysis or big data you will always still need to do your own research. Having sentiment analysis as part of your traders toolset can definitely help you making “the right call” as it is another point that you can look at before entering a trade to help you confirm your analysis. Cryptolume offers complete sentiment analysis for the top 400 cryptocurrencies, and you can get access to this data right away by visiting us here.